"Germany is totally controlled by Russia. They will be getting between 60 and 70 percent of their energy from Russia and a new pipeline." President Trump's point was that Germany's purchases of Russian natural gas were making Russia richer, and that this posed a concern for NATO. He later took to Twitter to complain "What good is NATO if Germany is paying Russia billions of dollars for gas and energy?" "Trump’s assertion that the pipeline will provide 60 to 70 percent of Germany’s energy is incorrect. While Russia will be able to increase the amount of natural gas it sells to Germany through the pipeline, Russian gas will only provide a sliver of the overall energy Germany needs. Germany’s energy comes from a diverse mix of oil, coal and renewables. Less than one fifth of the country’s power is powered by natural gas; at the moment, just 9 percent of the country’s power is generated by Russian gas." 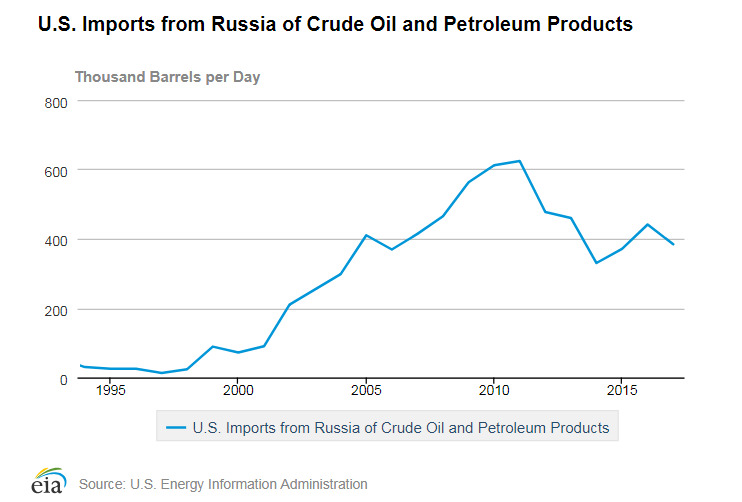 Incidentally, assuming $50 per barrel for those barrels means the U.S. spent about $7 billion on Russian oil in 2017. Total U.S. imports in 2017 were 10.075 million barrels per day. The Russian contribution was then about 3.8% of U.S., certainly not in the range of Germany's reliance on Russian natural gas. Russia was the 6th most important supplier of U.S. crude oil in 2017. The U.S. reliance on foreign crude in 2017 was higher for imports from Canada (39.9%), Saudi Arabia (9.4%), Mexico (6.8%), Venezuela (6.7%), and Iraq (6.0%). Overall, OPEC provided 33.3% of U.S. crude oil and finished products in 2017. We are certainly making OPEC richer with our crude purchases to the tune of about $60 billion last year. I can't say whether this poses a problem for NATO.